So, this place has been on my wish list of places to eat for quite a while. Is that normal to have a restaurant wish list? 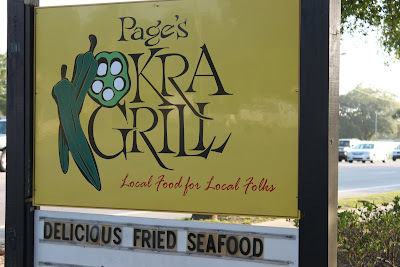 When we came to Charleston last September, I really wanted to try Page's Okra Grill. However, my son and I weren't feeling well so we quarantined ourselves in our hotel room for the duration of our stay. But, this time around, I decided to knock it out on the first night of our stay! Boy, am I happy that I did!! 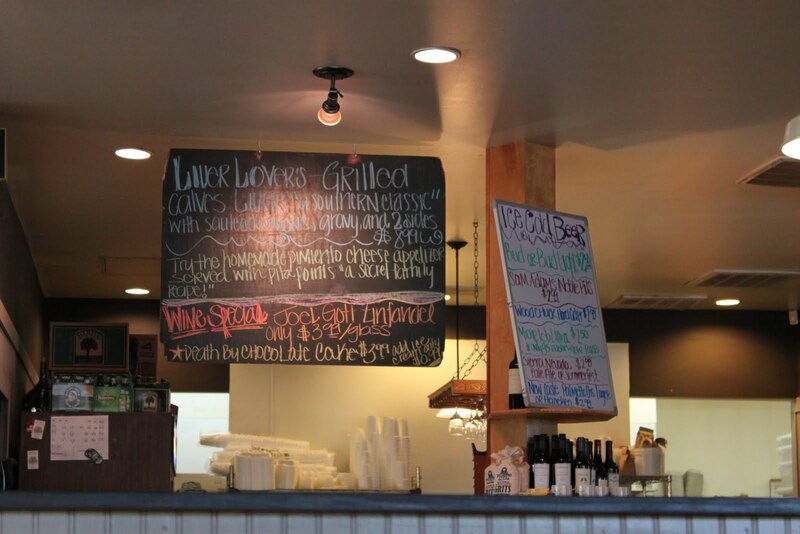 When I stepped into the restaurant, I was immediately attracted to the atmosphere. The outside of the building looked modern while the inside reminded me of a diner from the 70's, a family-style establishment with friendly waitresses and extensive menus where the food is prepared fresh when you order it. There was a sign that told us to seat ourselves which I haven't seen in years. 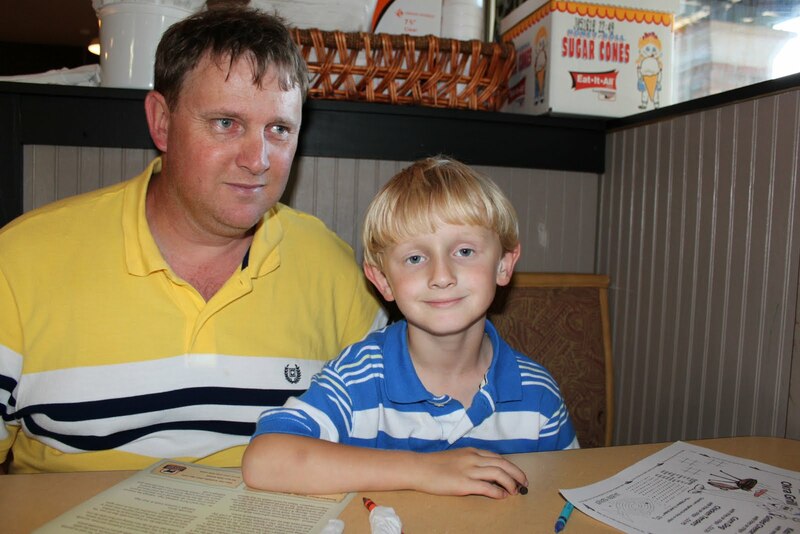 Of course, I looked for a booth that was as secluded as possible having kids and all. Between the menu and all of the hand-written specials boards, there was a lot to take in and choose from. While the restaurant is known for its fried chicken, I couldn't help but be attracted to the seafood. I ordered a stuffed flounder dinner that was one of the night's specials. Eric went for the fried seafood platter, but he was very tempted by the "Liver Lovers" meal. I did not share his enthusiasm for this option. 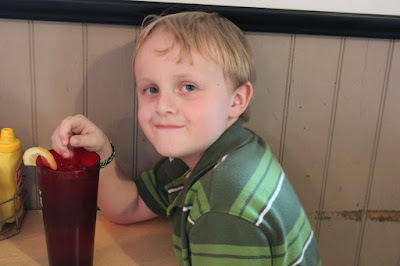 My 8-year-old was very happy that he was served a grown-up tea without a lid. Mama wasn't so pleased. My younger son was equally pleased. Until, in his excitement of the lid-free glass, he filled his mouth with too much tea, couldn't swallow all of it, started choking, and spit it out all over his shirt. This picture was taken mere seconds before the great tea explosion of 2011. On to the food - we ordered crab cakes for an appetizer. They were hot and fresh and full of crab meat. They were served with a spicy remoulade dipping sauce which I loved. There is also a piece of pickled okra on the dish, too. Eric ate that, too. 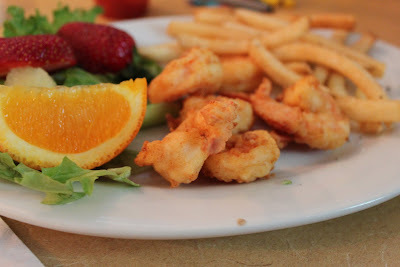 My older son ordered a kid's shrimp dinner. He was very excited to see the orange wedge. I ended up eating a couple of these shrimp and they were delicious. 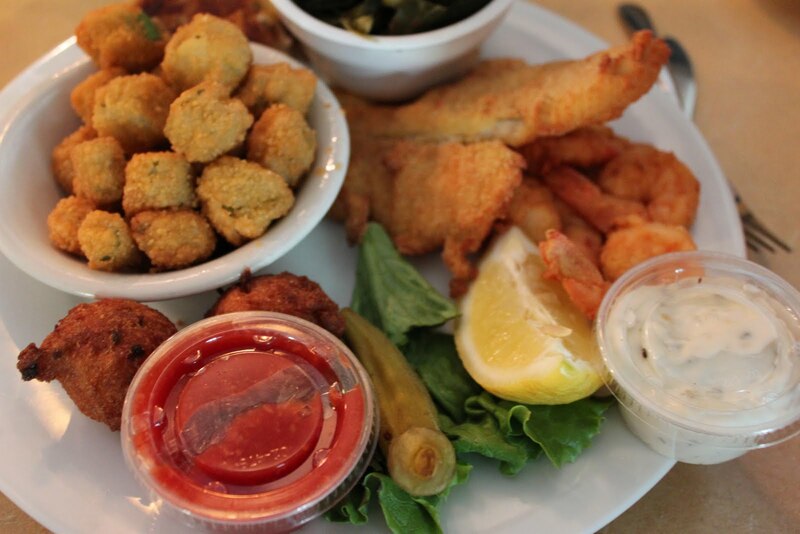 Eric ordered the fried seafood platter with sides of fried okra (do you notice a theme here?) and collard greens. The meal was served with fried flounder, fried shrimp and a crab cake. 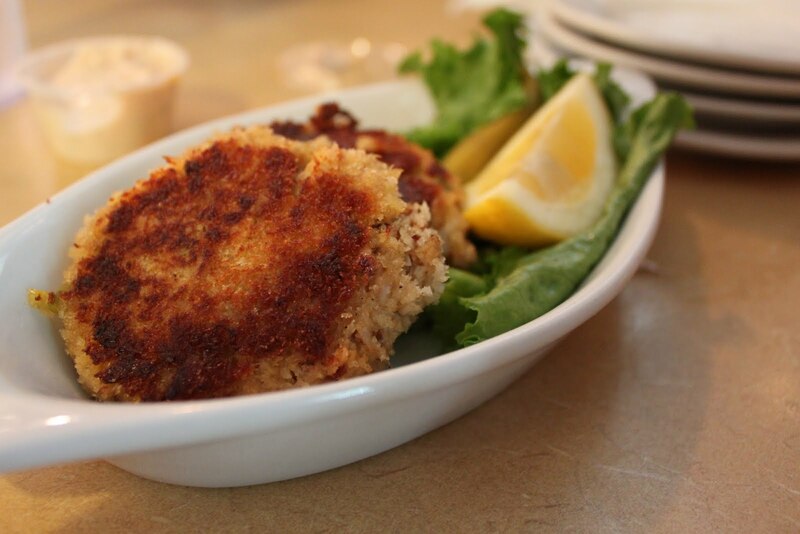 We didn't realize it would come with a crab cake instead of fried oysters. But, Eric got over the surprise very quickly. Yes, he ate the signature pickled okra spear, too. Ok, so first of all, I ordered fried okra, too, but somehow ended up with butter beans. 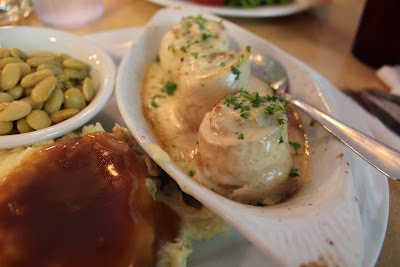 I got over it because all I really wanted to eat was the stuffed flounder. I expected a flat piece of flounder stuffed with crab. I was surprised and pleased to see these three stuffed flounder rolls in a creamy, savory sauce. They were absolutely delicious. I've got a feeling that they're going to haunt me for quite a while. 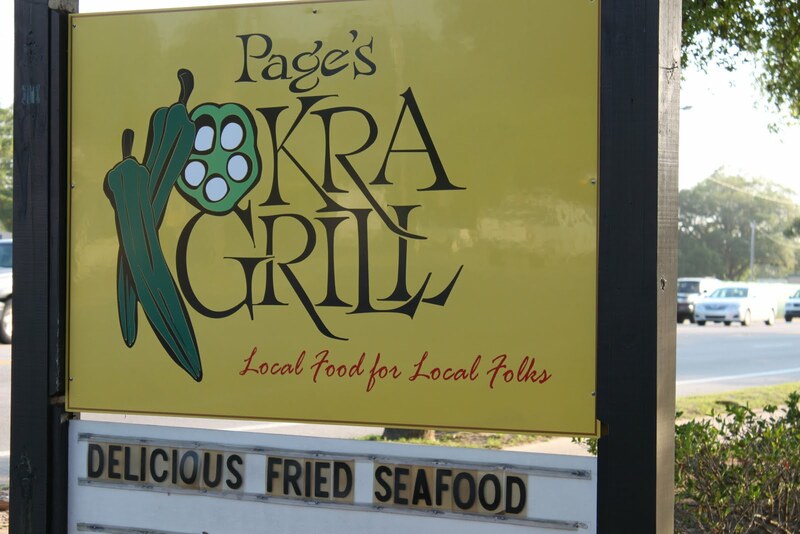 Page's Okra Grill's motto is "Local Food for Local Folks" and I'm here to vouch for that. I'm sure we were the only tourists in the place. Or, maybe I just think that because I was the only person taking photos. This place is open for three meals a day and I can't make any promises that I won't visit it again before this vacation is over. I can't stop thinking about the breakfast menu options: pancakes, waffles, french toast, biscuits, shrimp and grits...Yes, this is sounding more and more like a return visit. We'll have to try and stop in this place sometime, however, I can't eat shellfish, so crab cakes are off-limits. I'm sure there is fresh fish offered on the menu too. Thanks for the advice! I'm a local and eat there frequently. I usually have fried shrimp and they are always good and look just like your pic!